We all understand what’s it’s like to have a headache. According to research, more than 1.5billion working days are lost due to headaches. In fact, headaches have the power to turn the best of occasions into total torture. Despite other causes that can cause headaches such as chronic illness, we have an obvious cause which if you wanted you could avoid. That’s drinking alcohol. 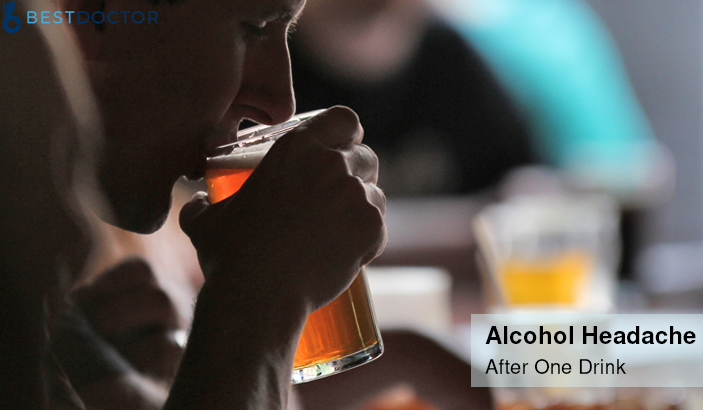 In this article, we will discuss alcohol headaches after one drink and how to effectively treat the condition. What Causes An Alcohol Headache After One Drink? According to the National Headaches Foundation, alcoholic beverages contain ethanol; when you drink alcohol, it makes your body to lose fluids which leads to dehydration. Severe cases of dehydration affect the fluids around the brain and decrease the blood pressure as well as the flow of blood to the brain. Reduced blood pressure in the brain can cause pain and sensitivity due to widening arteries to blood flow which in most cases results to headaches. There are a variety of compounds in alcohol that can cause post-alcohol related headaches. According to studies, these chemicals affect the immune system. These chemicals include tryptamines, flavonoids, acetaldehydes, and congeners among others. These chemicals usually have a connection with headaches as they interact with the brain chemicals leading to headaches and even migraines. While numerous chemicals-related factors can trigger a headache after drinking alcohol, stress can also be a possible cause. For instance, a negative mood after drinking alcohol can contribute to some people having migraine headaches regardless of what they have drunk. As we discussed earlier, not everyone is prone to alcohol-related headaches. For instance, people who experience alcohol headaches after drinking are likely to suffer the same each time they drink even if it’s after one drink. In addition, if you are prone to migraine headaches, then there is a high chance that you will have headaches after driving alcohol. According to research also, women are more likely to experience headaches than mean after drinking alcoholic beverages. There is only one sure way if treating an alcohol-related headache. That’s by avoiding alcohol. However, in case this is not an option, there are a few treatments available for treating this condition. For instance, Vanquish is known to quickly and effectively relieve alcohol-related headaches. However, remember that prolonged use of painkillers can cause complications to your body such as liver disease and therefore, it’s not recommended. If you have an alcohol headache, it’s appropriate if you rest. Also, consider sleeping, especially, if you haven’t had sleep for a while. Lack of sleep can make it worse. In addition, avoid eating sugar – it can increase the dehydration, avoid smoking, and limit your strenuous physical activities. Sleep and rest will speed up your recovery. You can consider going for foods such as bread that will help raise the blood sugar. Also, it’s easy on the stomach. In addition, fructose-containing foods also help metabolize the alcohol content more rapidly. Cereals and nutrient-rich foods are also quite effective. Add electrolytes in the food to help increase the calories and as well replenish the dehydrated system. Water is, in fact, the best fluid that can help replace the lost fluids in the body and reduce dehydration. Take a sip of water throughout the day to ease a headache. In addition, it can help flush out the impurities in your body. Other drinks like coconut water or bouillon soap are also effective as they help restore the potassium and salt lost in the body. Therefore are cases where you may need to see a doctor especially if you are prone to migraines. In most cases, alcoholic-related headaches may not require you to see a doctor because most of them go away on themselves after some time or after having some painkillers. However, if you experience serious reactions or severe pains, it’s crucial that you see a doctor. Also, if you on medications, it’s essential to consult the doctor because the condition may be related to an allergy with the medication. As said earlier, the best way to avoid these headaches is by avoiding it entirely. Despite effects such as headaches, alcoholic beverages are usually associated with other high-risk conditions such as liver disease, and therefore it should be avoided. An alcohol headache after one drink may not have serious effects, but continued use of alcohol is not good for your health. Catherine is a dedicated freelance health and science writer committed to excellence and professionalism. She specializes in health topics including diet and nutrition, immune-related diseases, surgery, and cancer. Next PostWhen To Go To The Doctor For Fever?